Notes: A wonderful journal full of fanworks including artwork and fan fiction from KupoCon’s community! The journal came to be after KupoCon’s first fanworks contest in 2016. 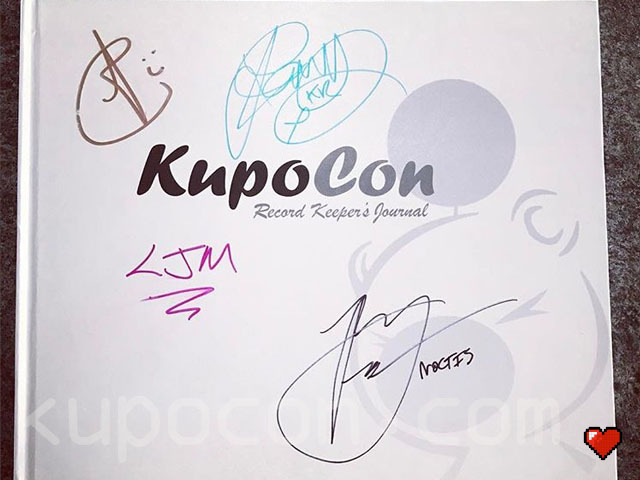 There are only a few Record Keeper’s Journals in existence, and the one shown above is signed by The Big Pom guests Susan Calloway (vocalist, FFXIV and Distant Worlds), Ray Chase (Noctis; Final Fantasy XV), Liam Mulvey (Libertus; Kingsglaive: Final Fantasy XV) and Jon Campling (King Regis; Final Fantasy XV). There is a dedicated website for Record Keeper’s Journal which also includes a digital copy of the journal to view online. The physical journal is available to view at the events along with the Snapshot Album. You can view a short video featuring the album here: Facebook Video. More photos and info coming after The Wee Pom!